Completely remove the turkey skin; wash turkey and pat dry. Mix the lemon pepper and Italian seasonings with the melted butter and brush mixture over the turkey breast. 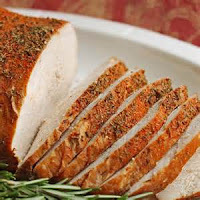 Place breast on a roasting rack in a shallow pan; cover with a loose foil tent. Bake the turkey at 375 degrees for 2 1/2 to 3 hours or until a meat thermometer reads 160 degrees. Remove the foil tent and continue to bake for another 30 minutes or until the meat thermometer reads 170 degrees and the meat is tender. Remove from the oven and let stand for 10 minutes before slicing.